An infection with the Epstein-Barr virus who have an intact immune system usually are asymptomatic. Infectious mononucleosis is a disease that’s produced by the Epstein-Barr virus (EBV), or the human herpes virus 4 (HHV 4). This is a disease that’s exclusively human. Normally, it affects children, teens, and young adults. 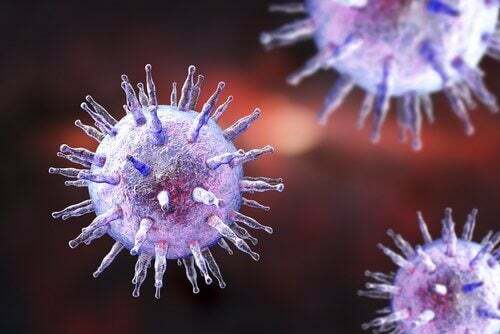 First, this is a virus with an affinity for B lymphocytes and the oropharynx. Secondly, this is a virus with an ability to stay latent (in a state of rest) and to deactivate itself when weakened by the immune system. In this article, we’ll take a closer look at this virus. The infection is transmitted directly through contact with saliva of infected people. Usually, the carriers don’t show any symptoms. This is the reason it’s often called the “kissing disease”. You can also catch it through contact with objects like cups or toothbrushes that are used by infected people. Also, there is the possibility to transmit it through blood (transfusions) or through a hematopoietic cell transplant. 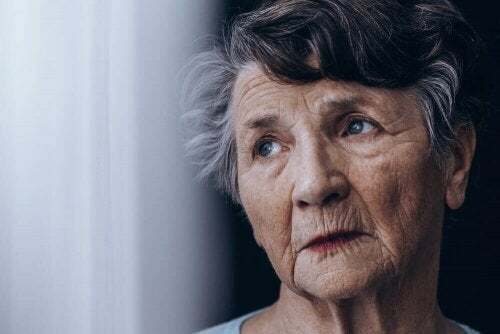 Typically, the age you may catch this disease depends on your socioeconomic level. In developing countries, this is a childhood disease. However, in more developed countries, this is a common disease among teens. The Epstein-Barr virus infection in people with an intact immune system is normally asymptomatic. As a result, it goes unnoticed. During childhood, the infection is asymptomatic in most cases. In teens and young adults, there are two possibilities. It’s either asymptomatic, or you suffer from infectious mononucleosis. 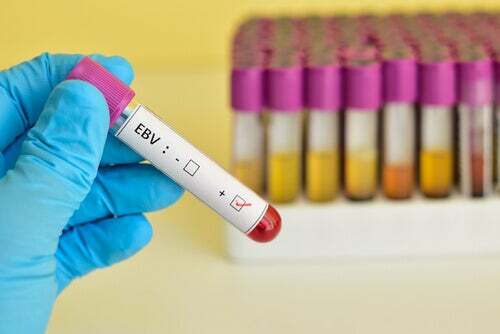 In adults over 40 years old, most of the primary infection cases of EBV result in viral hepatitis. However, the situation is different in individuals with a depressed immune system (like those with AIDS). In these cases, being infected by this virus can cause lymphatic tissue disease. This can severely compromise their life. 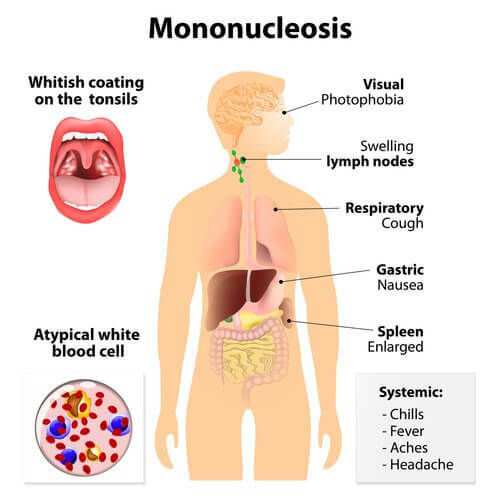 Infectious mononucleosis has an incubation period of between 4 and 6 weeks. Cervical lymphadenopathy: The lymph nodes in your neck usually swell very significantly. This is one of the most characteristic signs of this disease. Splenomegaly (increase in the size of your spleen) in up to 50% of patients. In some cases, the infection can cause intense fatigue (asthenia). The presence of atypical lymphocytes and heterophilic antibodies in the blood of patients is what helps doctors with diagnosing the disease. A complete diagnosis will show an increase in the presence of lymphomonocytes (over 4.5 thousand/mm3). However, this isn’t enough for a definitive diagnosis of infectious mononucleosis. Lymphocytosis may have a benign origin or change in when faced with an infectious or inflammatory process. It can also have a malign origin (like what happens in leukemia). Doctors can observe atypical or reactive lymphocytes peripheral blood smear (visual analysis). In this case, these are different from normal lymphocytes. They’re larger and have a more disorganized nucleus. This is due to the antigenic stimulation. This presence is indicative of how benign it is. The quickest test for confirming the diagnosis of infectious mononucleosis is a Monospot. This is a technique that allows doctors to detect the presence of heterophilic antibodies in these patients. Plus, it’s negative in other cases. Overall, this test is positive in 85% of infectious mononucleosis cases. Heterophilic antibodies are a type of pathognomonic IgM of the Epstein-Barr viral infection. In other words, they’re only produced as a result of this virus. Plus, they have the ability to bring together agar blood plates (Paul-Bunnell or Monospot tests). 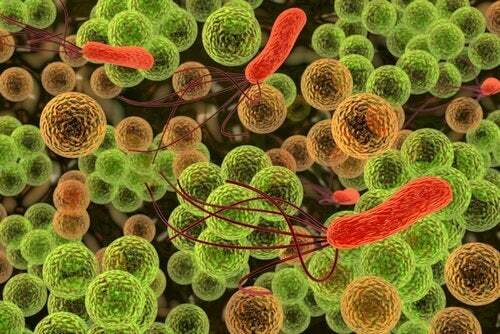 Testing these allows doctors to differentiate between acute and past infections. In the case of an acute infection, they’ll find Ac Anti VCA kinds of IgM in the first place. Their presence can be detected in your blood up to 5 months afterward. At 4 weeks from the start of the disease, the serum IgG Ac Anti VCA appear. However, Ac Anti-EBNA still can’t be detected. In the case of a past infection, they will be able to detect in the serum Ac Anti VCA and IgG Anti EBNA. No matter what, it’s important to undergo a differential diagnosis. Overall, the differential diagnosis should also factor in other causes of lymphocytosis, like leukemia and lymphoma. Patients with infectious mononucleosis who are treated with amoxicillin normally develop a general rash within three days of starting to take it. However, there is no specific therapy or treatment for infectious mononucleosis. This disease can produce a spleen rupture due to splenomegaly. However, this only happens in 1% of cases). Also, it may lead to hemolytic anemia due to the heterophilic antibodies that can cause lysis (destruction) of the red blood cells. When they’re destroyed, the bilirubin in them is freed. Because of this, patients with infectious mononucleosis can show jaundice (a yellow coloring of the skin and mucous membranes). In patients with Duncan’s disease, being infected by the Epstein-Barr virus can cause diseases with elevated lymphatic tissue mortality.